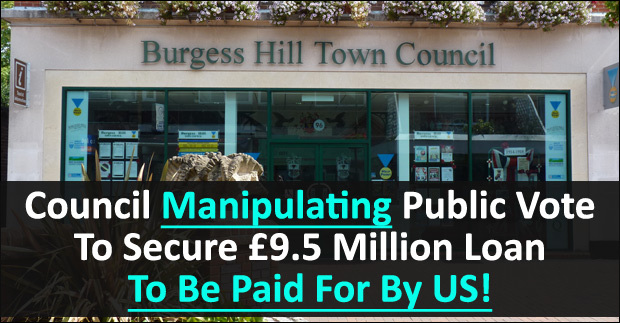 Burgess Hill Town Council have brought themselves into disrepute by currently running a biased public vote which is open to fraud and not a fair democratic process. The council are actively seeking people to vote yes while trying to put people off from voting at all if they seek to vote no. The authority are asking the public if they back a proposal to take out a £9.5 million loan to be paid over 50 years through a rise in council tax in order to pay for a new arts and entertainment venue after the Martlets Hall was given away to a private developer. Previously, Burgess Hill Town Council promised the public a new venue without it costing residents a penny. The councillors have refused to ask Mid Sussex District Council for a replacement or for a donation towards a new venue. Please complete the tear-off slip below and return it by 09 March 2018 to indicate if you are in favour of your Council Tax being increased to fund the development of a community and performance venue. In other words, if you don't want the building, then don't vote at all. This is what the council wants you to think as the 'Yes' vote doesn't actually need 50% of all adults to vote in order to win. Not only have the council provided a leading question designed to encourage support while also putting off the 'no' voters, even more scandalous is that the letter makes ZERO reference that there is an online voting form. Are more people likely vote if they knew they could avoid paying for a stamp or having to take their completed slip to the Help Point in person? This point is VERY important. In the background, Burgess Hill Town Council have been emailing the vested interest community groups, urging their members to take part in the vote ONLINE. The very voting process that they are trying to keep hidden from Joe Public. How can it be right that our public servants are targeting those more likely to vote 'Yes' while doing the miniumum possible to communicate with Joe Public who are more likely to vote no? These staff are supposed to be neutral and ensure that this process is fair. To vote online you only have to give a name, address and to tick the boxes to say if you are in support of, or against paying for a new community venue. You do not have to verify yourselves or provide an email address. You could sit behind a computer all day and fire off response after response from anyone whose address you know. You could even make up names. How are the council to know who has just moved to the area since the last electoral roll update? Why this is not being done in a sealed ballot is beyond us. What's to say that some of the 'no' votes won't conveniently end up in the bin? Burgess Hill Town Council have not included in the letter that the new venue was previously promised to the public for FREE. How differently might people respond to the vote if they knew the real history? The form is not clear enough in stating that the additional £12 charge will have to be paid every year for 50 years. Burgess Hill Town Council claim near unanimous support from a day of presentations attended by less than 500 people at a local church, yet many of these people came away thinking it was just a one off £12 payment and not for the lifetime of the loan. The council have also not said how any losses will be covered if the building gets up and running. You would assume the Burgess Hill tax payers would have to cover it. How much could the yearly losses run to? To general members of the public, Burgess Hill Town Council are billing this as 'Have your say' and a 'Consultation'. In actual fact, this is the FINAL VOTE. Nowhere on the letter does it mention the word 'Vote'. Community groups know that this is the final vote. It's clear to many that this process is not being conducted in a fair manner. It's causing widespread confusion, with a plethora of unanswered questions. Why would our elected representatives have signed off on a document which is balanced in favour of the 'Yes' vote winning? Why are they going to great lengths to contact all the community groups to tell them about the ability to vote online but keeping it from the rest of us? The public should have all the information presented to them clearly and concisely. People should have been told that this is the final vote. Why are the council pretending that it's merely a consultation? As it stands, the legality of the result could easily be challenged. This is the biggest decision that the Burgess Hill public will have to make in decades and it's turned into a total farce. Spread the word, the council have caused utter confusion as they seek approval to take out a £9.5 million loan for a new arts centre? What do you think of the council's communication methods which appear to be designed to ensure the yes vote wins?